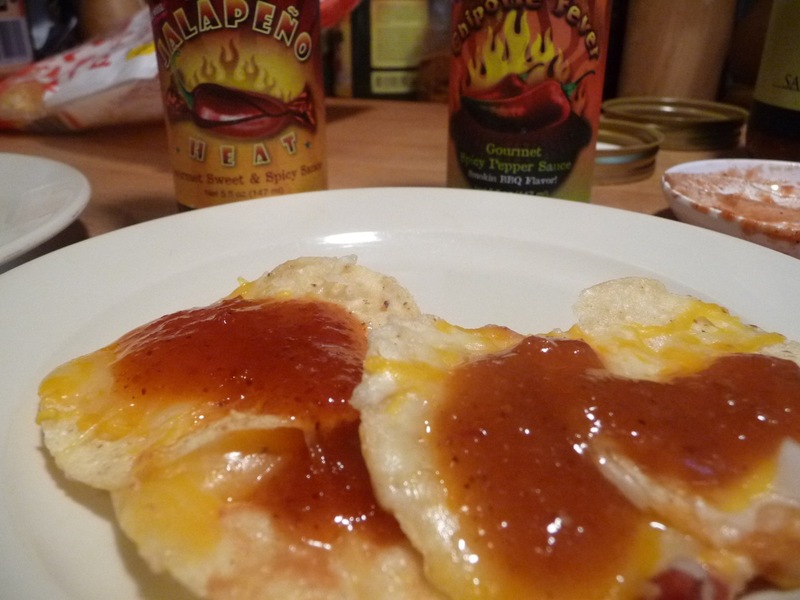 For Day 2 of our Week of Mild, we review a mild trio of Scotty B’s jalapeño based sauces – Chipotle Fever, Jalapeño Scream, and Sweet Jalapeño Heat. Scotty B sent me his lineup of 8 sauces awhile back. His flavorful mild sauce trio fit right in with this series, so I’m beginning with his mildest of mild and working my way up. Overall, I do like all 3 of these sauces from Scotty B, so don’t be turned off by the first review… it’s really mild – almost “sub-mild”. And kudos to Scotty B for using “wide mouth” bottles (the 5 ounce “woozies”) and no restrictor caps. These are my kind of bottles. I know I said these were jalapeño sauces, and in fact, chipotles are jalapeños that have been smoked, so we begin with Scotty B’s Chipotle Fever Gourmet Spicy Pepper Sauce – Smokin’ BBQ Flavor. Yea, that’s a mouthful of a name. Let’s see if it’s a mouthful of flavor. A nice simple list of ingredients – I’m especially curious about the “chipotles in adobo” as chipotles are my hands down favorite chile profile. I. Love. Chipotles. Texture & Appearance: This reddish orange sauce pours easily. It sets up well, and does not run. 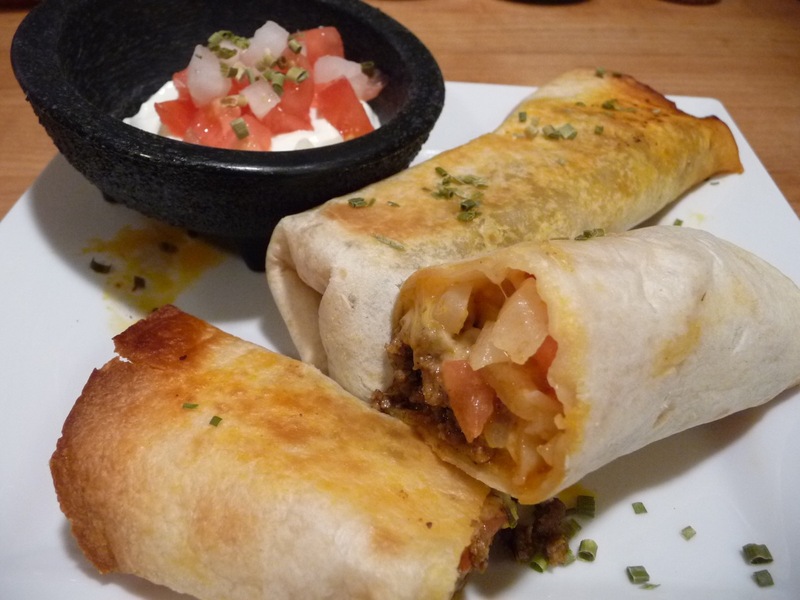 There are small bits of peppers and veggies throughout that give it a nice texture. Taste Straight Up: There’s only a slight remnant of smoke from the “chipotles in adobo sauce” ingredient. If you’ve ever opened a can of Chipotles in Adobo sauce, you know that – A. there’s a ton of heat in those chiles, and B. the smoky flavor is deep in the spicy, tomatoey adobo sauce. 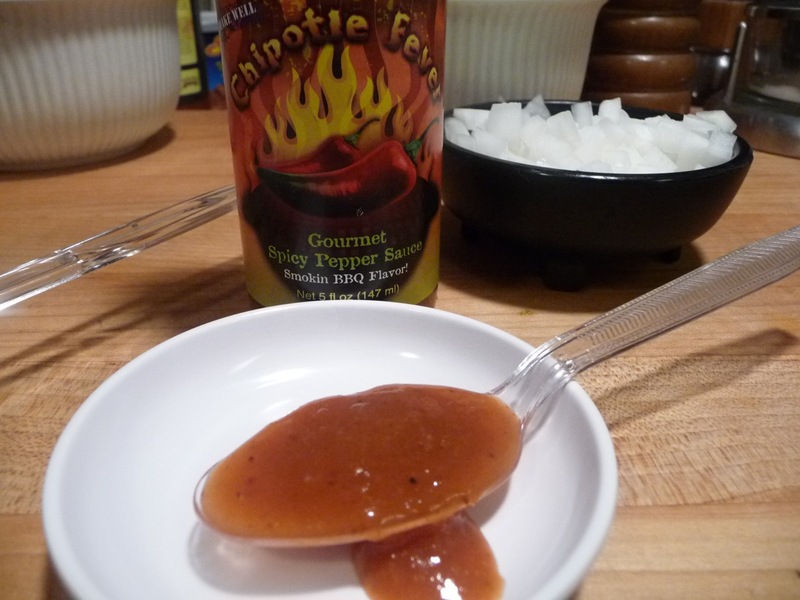 This Chipotle Fever is a very mild, almost watered down version of chipotles in adobo. It’s a delicious but VERY mild sauce that I could just glug from the bottle, and it would be gone. For the timid chilehead or cook out there, I would recommend this sauce… it’s that good and that mild. Heat Level: – If I had a 1/2 star (I gotta work on one of those), I’d award it here. Very tame. Tabasco is hotter. Final Thoughts: I don’t get the “Smokin’ BBQ Flavor” on the label. To me, there’s nothing barbeque about this sauce’s flavor. It’s simply a very mild sauce, that your grandma could handle. And you know how old she is! I credit the “corn starch” for the ever so slight thickness and mouth feel that is just a wee bit tacky. But the bright flavor makes up for it. Not too shabby for what is Scotty B’s mildest sauce. Texture & Appearance: Thick, slightly chunky, with a bright green color – the texture has that “gourmet” feel in my mouth. Very nice texture and not as “tacky” as the Fever sauce. Very palatable and classy. Taste Straight Up: Now we have some heat. For a mild sauce, the burn is a classic jalapeño pepper tingle. It covers the tongue, but is short lived. The big, bright flavor of this sauce screams (get it?) jalapeño! This is truly a damn good green jalapeño hot sauce. Heat Level: – The burn on the tongue is of a classic jalapeño heat. The tingle stayed with me for a few minutes. We’ve gone from the “sub-mild” to real mild. Very satisfying. Final Thoughts: The tomatoes in the mix brings a scent of “italian” flavor – I know that’s weird, but it’s there. This is a very good, green jalapeño mild hot sauce. I highly recommended it for a great flavorful mild sauce. 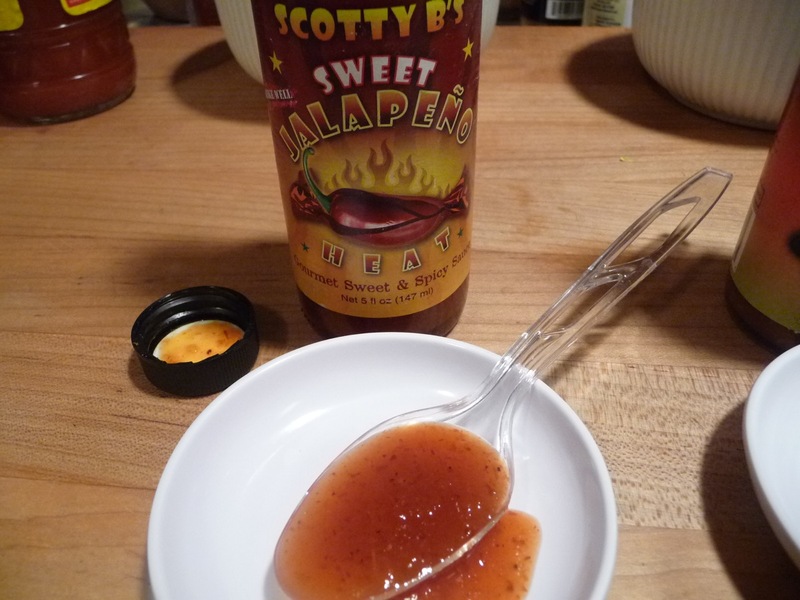 Technically called Scotty B’s Sweet Jalapeño Heat – Gourmet Sweet & Spicy Sauce, we are kicking up the sweet/heat level here by a factor of 10. This is my favorite of the trio, as I do love me some sweet heat. I think it’s a tricky balancing act to bring on a nice sweet flavor, along with some spicy heat – and this sauce has both. Hotter than it is sweet, it’s a nice blend of the two worlds. Texture & Appearance: The thinnest of the 3 sauces reviewed here, the Sweet Jalapeño Heat is still thick enough to stay together on a spoon, and coat your pizza or nachos nicely. Taste Straight Up: The heat comes on very slowly, so you get a chance to savor the sweetness. It’s a subtle balance that is very enjoyable. Heat Level: – I got a little head sweat going here. While not quite hot enough for a full 2 stars rating, it’s got a nice mellow burn. Much more mellow than the previous Jalapeño Scream sauce. Final Thoughts: Definitely my favorite of the trio, Sweet Jalapeño Heat brings the perfect balance of sweet and heat. 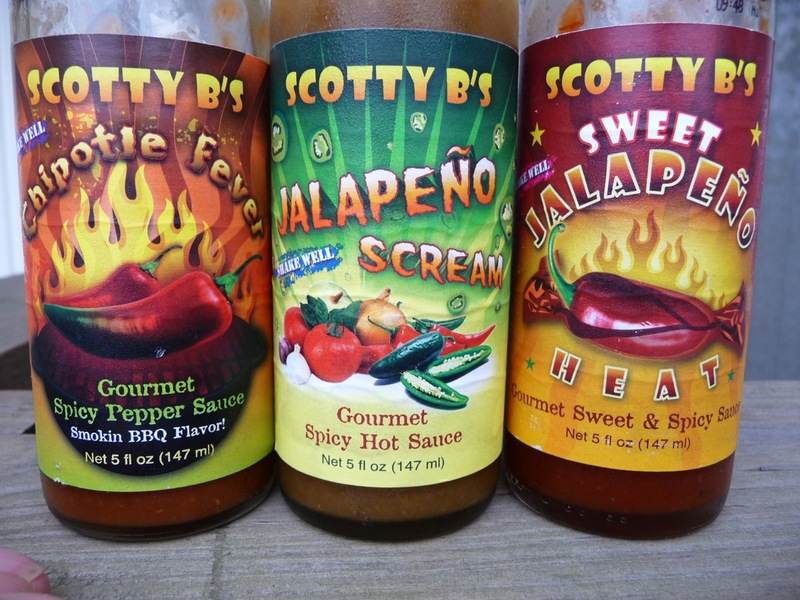 Label/Graphics: All of Scotty B’s sauces sport the same classy label, with “Scotty B’s” prominently at the top. They all feature flames and peppers in the middle of the label, and all have a sub heading at the bottom of the label declaring and specifying further what they are – in the case of these three we have “Gourmet Spicy Pepper Sauce – Smokin’ BBQ Flavor”, “Gourmet Spicy Hot Sauce”, and “Gourmet Sweet & Spicy”. Overall Rating (Taste on Food, Final Thoughts): All three of these sauces taste great on pizza, and on nachos. I favored the Sweet Jalapeño Heat. Marilyn preferred the middle of the bunch, the Jalapeño Scream on hers. I already mentioned the big mouth 5 ounce bottles are a nice touch. All of these sauce are available in the 5 ounce versions, as well as a bigger 12 ounce bottles (highly recommended). There are gift sets available too. 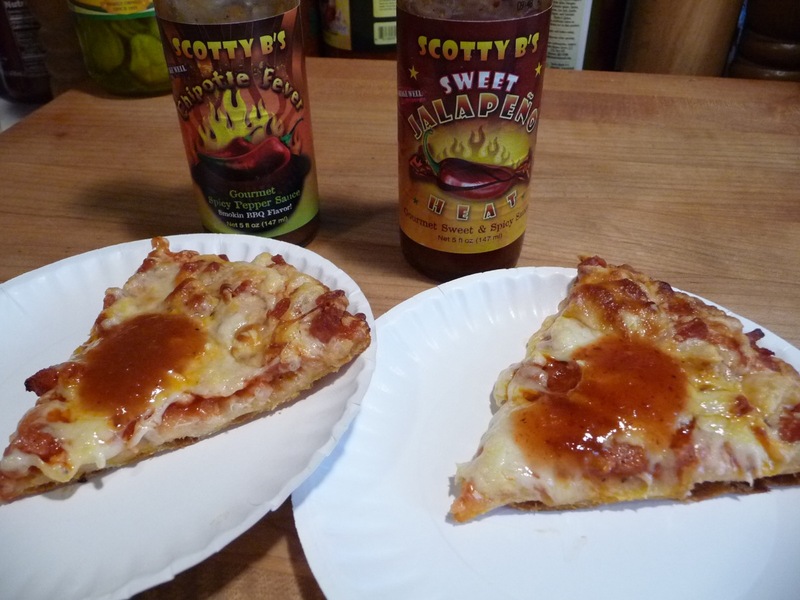 Visit http://www.buyscottybs.com/ for these sauces and his other hotter sauces. Tell Scotty HotSauceDaily sent you! Disclaimer: We received these products courtesy of the manufacturer for review. What a great lineup of Jalapeno sauces! 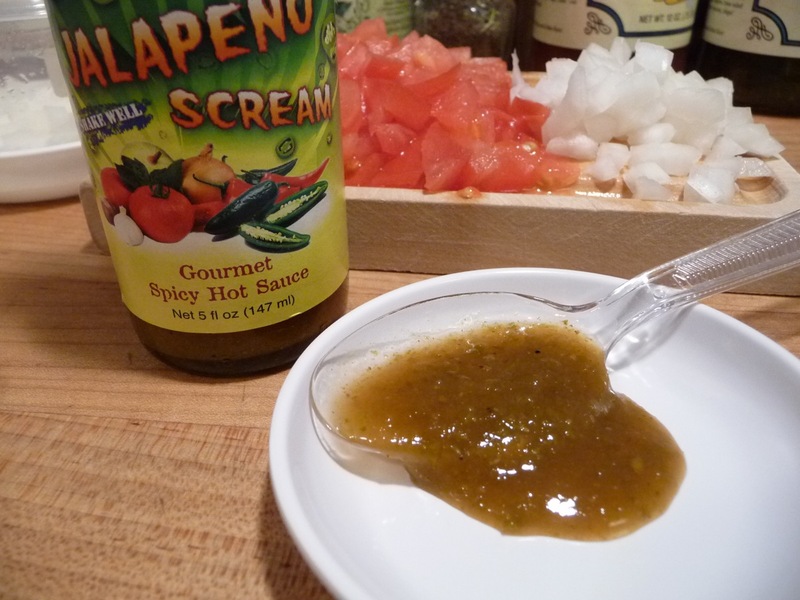 My fave has to be Scotty B’s Jalapeño Scream – my mouth was watering just looking at it! My grandma is dead, what are you saying!?!?!? Just kidding;) I really like the sound of the Jalapeno version, sounds like one I would like.